​ICSS promotes, supports and provides leadership to improve social studies education. ​Our vision is to be the premier organization of Iowa Social Studies professionals, ensuring that all students have a high quality Social Studies education. ICSS Newsletter shared electronically each month during the school year, provides timely information regarding ICSS, lesson ideas, tips and opportunties for Iowa social studies teachers. To represent the social studies profession. Have democratic procedures for the election of officers. Have demonstrated professional activity, such as workshops, conferences, and generally, programs that promote the social studies within their region. Have actively participated in NCSS programs, such as brokering, submitting nominations for NCSS awards, attendance at the Summer Leadership Institute and legislative networking . Have actively participated in social studies legislative advocacy efforts at state and/or at Federal level by: responding to NCSS legislative advocacy calls, disseminating calls to council members, building relationships with legislators, having an active legislative liaison, and developing a legislative advocacy plan. Have 100% NCSS membership of council officers. Have a specific plan for increasing NCSS membership in their state and underrepresented groups in their council. Have shown an increase in the number of joint members. Submit affiliation materials by deadline. 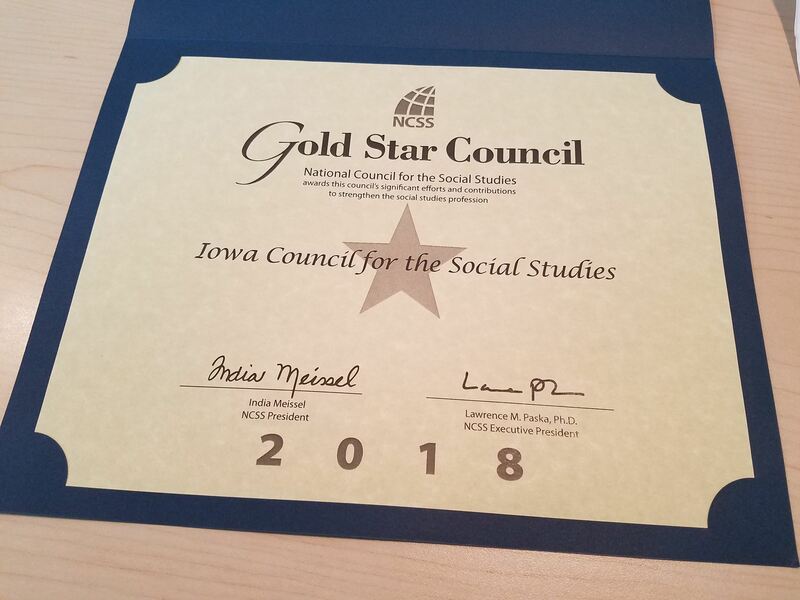 ICSS Executive Board members Catherine Mein and Todd Hospodarsky accept the Iowa Council for the Social Studies reward as an NCSS Gold Star Council.